Our wonderful guests tonight are Paul Burston & Julie Bindel, Naomi Paxton and Tim McArthur. Author and journalist Paul Burston is busy as ever. Together with fellow journalist Julie Bindel he launched a new magazine called “Gaze – A Modern Review”. The first issue is out as an app on 20th April. It will steer away from the light-weight magazines that are out and look at the world around us more closely and dare longer articles online, especially since many magazines such as Time Out don’t offer in-depth reports anymore. Julie and Paul are the Managing Editors of “Gaze – A Modern Review” and with their often divided opinions the magazine will be an interesting read. For updates check their Twitter feeds @GazeReview. Actress and comedian Naomi Paxton tells us about “Stage Rights! 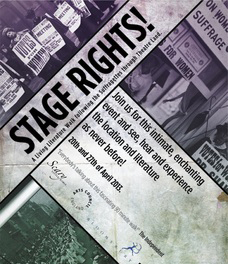 A Living Literature Walk following the Suffragettes through Theatre Land”. It is based the “Methuen Drama Book of Suffrage Plays”, which Naomi edited and which was published earlier this year. On the tour one can meet Suffragettes played by members of the company Scary Little Girls, who bring texts from the book to life. The tour takes place on 20th and 27th April. Besides these tours, Naomi allows her alter ego Ada Campe perform more tricks at Femmes by the Thames on 9th May at Battersea Barge and will talk about the Suffragette texts at the National Theatre in June. Comedian, director and The Curtain Up Show host Tim McArthur tells us about “4 Poofs and a Piano”, which he directed and will be at the Charing Cross Theatre on Sunday 14th April. He remembers the fun during rehearsals but also the importance of focusing on the performers voices as their camp act could easily get out of hand. Following Margaret Thatcher’s recent death, Rosie and Tim recall what it meant being gay in the 1980s and the difficult times they had faced. This entry was posted in Listen again and tagged 4 Poofs and a Piano, Gaze - A Modern Review, Julie Bindel, Naomi Paxton, Paul Burston, Suffrage Plays, Tim McArthur. Bookmark the permalink.